I had a very nice surprise this morning. I was sorting through some folders for a graphic for Motorcycle Live and I found this review on ‘Into Africa’ from Adventure Motorcycle Magazine (ADVMoto) I’m very grateful to them for the amount of time and thought that went into this. 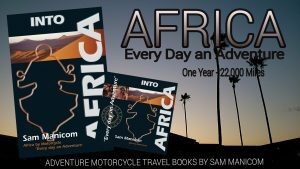 Sam Manicom considered himself an “ordinary bloke” when he undertook to ride a motorcycle the length of “The Dark Continent.” Yet he knew the journey upon which he was embarking was anything but ordinary. Could he have imagined the transformation he would undergo during this adventure of body and spirit? The story of both his trip and his transformation are well told in Manicom’s book, Into Africa, which provides a detailed account of the author’s experiences and their deep impact upon him. Manicom was a shop manager on Jersey, one of England’s Channel Islands, when, in the early 1990’s, he decided to acquire a motorcycle, learn to ride it, and then to pilot it across Europe and down the length of Africa. Like Sam, I had been inclined to think, “If I can do it so can you.” I realize now that I believed, whether consciously or subconsciously, that people have only their own self-limiting attitudes to rise above if they truly want to seek adventure. But that is neither fair nor uniformly true, as Sam observes. His point is well made, and his story reveals not only a spirit of determination but also a significant empathy and respect for his fellow man. When Sam decided to give his life “a damn good shaking” he chose a BMW R80 GS to do it on. At first a nervous rider, feeling as if he were “riding a drunken pig,” Sam soon became a capable rider and seemingly one with the bike (which he eventually named “Libby”) after covering 22,000 miles, from Alexandria, Egypt to Durban, South Africa over the course of a year. Mark Twain (as quoted in the book by Manicom) said that “Travel is fatal to prejudice, bigotry and narrow mindedness” and this holds true. Towards the end of his journey, Sam realized that “Africa was continuing to change the way I both saw and thought about things.” In retrospect, the challenges seem daunting . . . if one had known, would the journey ever have begun? But the rewards were great . . . a sky-high stack of experiences that most of us neither will have nor would have imagined if Sam hadn’t gone to the trouble. I found myself wishing there were more photos, but I am sure Sam does too. Unfortunately, numerous rolls of film were ruined late in the trip. Nevertheless, he tells the story with rich detail of the terrain, the people, the food, and the circumstances, creating that vivid imagery of the mind only made possible by the written word. If you’d like a copy then The Book Depository do Free World-wide delivery from this LINK.